“There are not enough words of gratitude to Billy McLaughlin who was our incredible speaker for the Epilepsy Foundation of Western Wisconsin’s Share the Flame and Silent Auction on December 3rd, 2013 at Fanny Hill Dinner Theater in Eau Claire. Our guests who are business professionals, medical staff, family, and personal supporters of our mission, were absolutely amazed at Billy‘s powerful performance and inspirational story. He kept all of us spellbound, with his presentation and music. 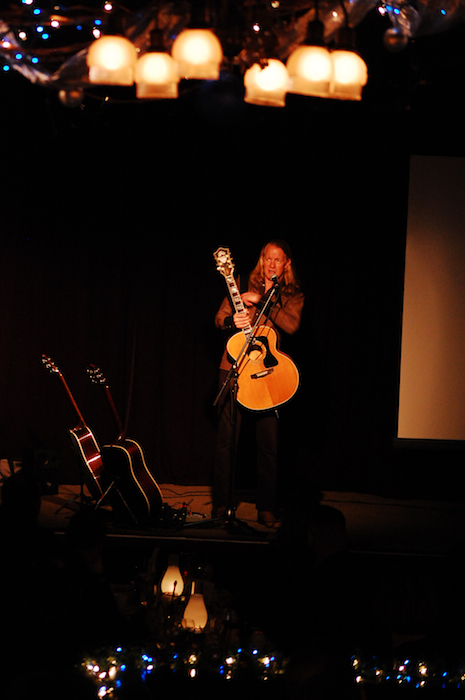 “Many of our guests knew of his music and talent in the 1990’s and were amazed at the challenges he has faced over the past years with focal dystonia which forced him to relearn how to play his guitar. His personal story as a single father with a son, who has many challenges with epilepsy, warmed our hearts and created understanding in the reality of how difficult living with seizures can be. His amazing personality, and determination to make his marvelous comeback and his life more meaningful and positive made an awesome impact on everyone!